« Trapped by a Bear! The word, addiction, has been defined as: the state of being enslaved to a habit or practice or to something that is psychologically or physically habit-forming… to such an extent that its cessation causes severe trauma. Some addictions have their own pleasant rewards. 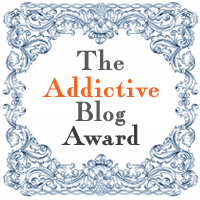 Congratulation to Kate Kresse of Believe Anyway for receiving the Addictive Blog Award. Her blog is inspirational (and yes, addictive) and a must for those of us who need a little extra push, a bit of motivation, the courage to go on. I am privileged too because she has nominated me for the very same award. Thank you Kate! Nominate up to ten other bloggers you think are addictive enough to deserve the award. About a year ago, my friend, Julie, the owner of a local gift shop, asked me to sit in on a training session on blogging for business. I was writing promotional copy for her gift catalog anyway and she thought I might be interested in developing a blog for her as well. So, I sat in on the session as a blog was created for Virginia Born and Bred called The Virginia Shopper. I became “the shopper” and began to write and write and write. I loved it! I was writing to sell, but I imagined writing a personal blog too, and wished for my own blog to be something I could share with my grandchildren. So, I started one called Technicolor Daydreams. That’s when there suddenly emerged a blogging “community” of fascinating, delightful, interesting and inspirational people who love to share their talents and comment on mine. I hold my circle of friends in cyberspace very close and each one is most dear. Reading their thoughts and viewing their art and photography is every bit as addictive as writing my own and there is never enough time in a day to do them all justice. I feel like a mother with way too many children and at the same time, a child needing confirmation. Addiction Can be a Wonderful Thing! I look forward to checking out the blogs you have recommended. Congratulations on receiving the Addictive Blog award. That’s quite an honor. Congrats Dor, and thank you so much for becoming addicted to my blog!! Hurry back! Please. And you are welcome… your blog posts are definitely addictive. While getting my ‘fix’ this morning reading my favorite bloggers’ posts, I was just tickled pink that you won this award. Then as I near the end of your post, I find that you’ve nominated me for this award too. Can I be any pinker?? 😉 Dor, you are such a gem and your blog and enthusiasm for country life is very addictive! Thank you, my sweet friend! Love the phrase “tickled pink!” I haven’t heard it in years. Congratulations Mama. Your award is very well deserved. I love your stories and they are addictive! Thanks for mentioning me. I am humbled. Thanks, Dor, and Congratulations. You deserve this and I’m always looking for new blogs to enjoy. I appreciate the sharing. I am flabbergasted at the thought that someone (other than my husband, of course) finds me addictive, like Ben and Jerry’s Cherry Garcia. Made my day, Dor! Awww, you are so sweet! I wish you could see my living room walls where I have framed some of my favourite photos. I smile every time I walk into the room :). Dor, congratulations on receiving the Addictive Blogging award! Your blog is truly deserving of this honor. Thank you so very much or the nomination. I am very proud to be included in this list of talented writers. You are right, blogging IS addictive, but good for us, too. I have so enjoyed meeting new people and counting them as friends, even though we have never met. I love learning about the different ways we all live, and yet we are all alike, too. You are entitled to be proud! Take a picture of your living room walls to share in a blog post maybe? Thanks Tilly-Bud… I love being addicted to blogging too.